On April 26, Singularity University (SU) opened its Singapore Chapter. Before the launch, OpenGov conversed with Mr. Kip Stringfellow, Director of Strategic Relations and Dr. Eric Rasmussen, Associate Faculty – Disaster Resilience from the global headquarters of SU, along with Mr. Charlie Ang and Dr. Steven Tucker from the local chapter. Mr. Ang is the ambassador of the Singapore Chapter, while Dr. Tucker is a leadership team member and Global Health Advisor. SU is not a university in the usual sense of the word. It seeks to provide learning and innovation platform for empowering individuals and organisations with the mindset, skillset, and network to build breakthrough solutions. It brings together entrepreneurs, corporations, development organizations, governments, investors, and academic institutions through educational programmes, conferences, incubators and more. Founded in 2008 by Peter Diamandis and Ray Kurzweil, SU is located in Silicon Valley in California, at NASA Research Park. Starting with Google, several large corporates came together to create an organisation that focuses on learning where the future is going and all the opportunities that technology presents for humanity (list of partners/ sponsors). Singularity University (SU) was founded on the premise that the world’s greatest problems are the world’s greatest opportunities. Mr. Stringfellow described SU as a future-focused organisation, looking at a group of global grand challenges: Energy, Environment, Food, Shelter, Space, Water, Disaster resilience, Governance, Health, Learning, Prosperity and Security. SU is a registered as a Benefit Corporation in the US. Benefit Corporation is a type of for-profit legal corporate entity, that includes positive impact on society, workers, the community and the environment in addition to profit as its legally defined goals. SU focuses on the fastest moving technologies in the world, the exponential technologies, especially information enabled areas, where computing power is driving unprecedented changes. This includes artificial intelligence (AI), augmented and virtual reality (AR, VR), data science, digital biology and biotech, medicine, nanotech and digital fabrication, networks and computing systems, robotics, and robocars. Within that context, SU runs a lot of different types of programmes to help people understand not only where the world is moving to, but also how to leverage that understanding to create new products, companies, services, innovations that fix some of those really big challenges in the world and create better lives for people. There are several programmes hosted at the SU campus in NASA Research Park in California, such as the Global Solutions Program, wherein a group of entrepreneurs and technology experts get together once a year for 9-week immersive, residential experience. In addition, SU organises a lot of programmes in multiple formats internationally in other parts of the world. Chapters serve as an extension of what SU is in a city and a country. SU chapters are present in 60 different cities around the world. Alumni organise chapters, which is for alumni as well as non-alumni. There are events and activities to help people understand what is happening in the world, and to facilitate connections. Alumni apply through a formal process at SU and the applications are reviewed and then approved to ensure that the chapters are run effectively. “It’s really important for us to democratise some of the information we have at SU programmes back in California and create a platform for people to form connections just beyond alumni,” Mr. Stringfellow said. Expanding on the theme of democratisation, Mr. Ang said that not everyone can attend SU’s programmes. One of the Singapore chapter’s primary objectives is to evangelise and create awareness of the exponential mindset, so that Singaporeans are better able to manage the disruption and be proactive in transforming their organisations and their own lives. SU’s website says that an exponential mindset is a point of view at SU that there’s no problem that cannot be solved by apply exponential technologies and innovative ways of thinking. SU believes that things aren&apos;t going to change incrementally or linearly, they&apos;re going to change explosively, exponentially. As Mr. Ang said, it is about impacting millions or maybe even billions of lives. “We want to encourage Singaporeans to think bigger, to work on moonshot innovations, to come up with indigenous, breakthrough ideas,” Mr. Ang said. He gave the examples of Astroscale, a local company which is developing innovative solutions to remove space debris and Temasek Rice, a new breed of rice that is environmentally friendly, requires less water and land resources. He added that mot existing accelerators and VCs are mainly profit-driven. 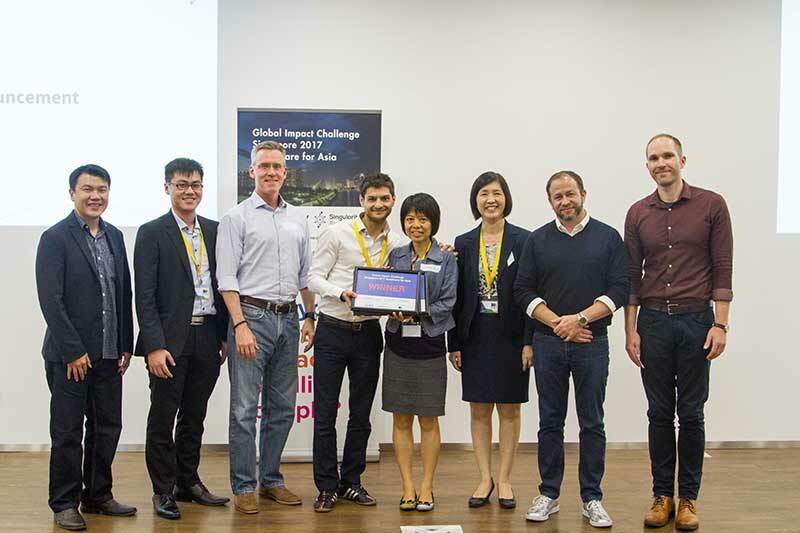 Whereas for SU, it’s very much about using technology to create an impact in the grand challenge arenas, creating real, positive impact on people’s lives. The innovation doesn’t necessarily come from a brand new technology. It could be just doing something we have always been doing a little bit different or putting two things together. Dr. Tucker mentioned Livongo as an example of the latter. Glucose meters have been there since a long time. Livongo just integrated communication technology with it, enabling automatic upload of blood glucose readings, making them accessible online to family or health care professionals. Dr. Rasmussen explained the broad approach called backcasting which is used at SU for dealing with the big problems. It starts with conceiving what a solution to those problems might look in 2050. Then imagining what would have gone well to get us to a desirable position on that problem in 2050. And then to get there what steps must we have taken between then and now in order to achieve that very desirable goal. Dr. Rasmussen went on to highlight some interesting aspects of SU’s approach to innovation. The first is that It is not just about incorporating technology. Policy, ethics, philosophy, law and legislation are threaded throughout to ensure that people gain an understanding of the information society that’s gradually encroaching on all of us and understanding how the technologies can be employed responsibly. The intention is to have a way of anticipating the likely impact rather than reacting to it. He said that Singapore is exceptionally well placed for that kind of foresight. Secondly, SU is also very attentive to the cross-pollination that is necessary in both looking at the problems themselves and the integration of all the technologies that are coming together, coupled with the exposure that people have within their own cultures, within their own languages and educational systems. That’s a holistic approach to looking for solutions using every resource available to humanity. Dr. Rasmussen said that SU goes to some trouble in its pursuit of ‘Radical inclusion’- the inclusion of absolutely everyone, who might have an interesting idea, no matter how exalted or how minor, regardless of whatever their current job might be. SU seeks to provide them a fair hearing based on merit. There are numerous examples sprinkled through out history of interventions or innovations to solve a problem having unintended side-effects, sometimes positive, sometimes negative. We asked what happens when an innovation which could make a significant contribution to solving one of the grand challenges, has unintended consequences in some other area. But now there are highly sophisticated models, much more so than were available a decade ago that can enable a great deal more nuanced understanding about what the likely repercussions could be. “The task for us at SU and in fact, for anyone working in the humanitarian space who sees a technology coming, is to foresee where this is likely to go badly. And then continue the design science around its development in ways that minimise the likelihood of a bad thing, and optimise the range of good things,” Dr. Rasmussen said. 1The winner proposed an AI technology based solution, which imposes subtle changes to our behavior with the goal to avoid diabetes risk, making use of personal/meta-data from previous searches/purchases and mobility behavior, social interactions)and health data (i.e., genotype, health exams, etc.) of the user to create a personalized profile of what he/she does, what she/he thinks and feels.